Today I Microstation was installed on my computer at work. We are using the J version and V8 2004 (I may have the terminology wrong here). My first impression is that it doesn't look like Windows, which isn't a bad thing always, but in this case it looks barely better than a first version of a program converted from DOS to windows. The icons look older than they should and it just doesn't looked polished. My first impression isn't good for the Microstation. I went to help to see if there are some tutorials, I couldn't find any so I just clicked on things and tried to see what buttons did. I didn't have much luck figuring things out. Hopefully I can find some tutorials in the future and learn how to use the program. If you haven't heard, sustainable design is supposed to be the next big thing in development design. After hearing some things about it, I'm wondering if people actually want it. I think in theory if you just ask people if they want sustainable design they would indicate they would want it, but in actuality will they buy into it? Not being close to a subway (mass transit). The requirements largely go counter to what sustainable design strives for. The density is supposed to reduce the need for a car, but they need to commute regardless. The housing is supposed to be near mass transit, but the noise created by the mass transit is not something they want to deal with. Well a larger place isn't really related to sustainable design in land development, but it does affect the energy use in the building. A larger place typically requires more energy use, but the energy use of the building didn't appear to factor into their decision. I guess it may have come into play if one of the houses used it as marketing tool to make the a condo/house more attractive. I guess my real problem with sustainable design is that it's being sold as something people want, but if you watch people and their decisions they mostly (or large portion of the population) don't factor it in their decisions. I suppose the people who put together the sustainable design want the designs to be that way? Or do they too not live in houses that meet sustainable design? I know I don't, but I don't think that is going to stop me from working on sustainable design projects and assisting my company in marketing it to potential clients. Isn't that all it will be in the end, a marketing tool without much real meat behind it? On the 6-30-2007 date on this website I previously posted a VBA macro to get pipe and structure quantities from a drawing. This is an example of how to export information to Excel and then modify it. So lets say you thought it was neat, but wanted to change what it did in Excel and didn't have much VBA experience. An easy way to see what direction you should go in would be to use the macro recorder in Excel. To get to the macro recorder in pre-2007 its under Tools => Macro => Record Macro. In 2007 you will have to go to the Microsoft symbol and select Excel Options. Under popular, check the "Show Developer tab in the Ribbon". In the Developer tab use the Record Macro button and press Ok when the Record Macro dialog box pops up. Excel will now keep a record of all of the movements and commands you do. Do what you want the routine you are creating to do. When you are done press the Stop Recording button (before 2007 it is on toolbar that pops up when the recording starts, in 2007 it is on the Developer ribbon). Once you stop the recording choose the Visual Basic option to see the code that was created. The code Excel created is in the next picture. It will take a little work to make AutoCAD do the commands in Excel, but the sample mentioned earlier should start you on your way or take a look at the AU class I did which has another example. It looks like I may have to learn Microstation in the next few weeks. Should I post about Microstation here or do you want have this site only to be Civil 3D? Vote in the poll on the right, majority rules in this case. The poll will be open for a week. I usually forget to use this but you can use Sheet Set Manager to take model space views from one drawing and place it into the layout of another sheet. To do this open sheet set manager and go to the Model Views tab. Right click on the Add New Location... and add a new location. Select the folder with the drawing(s) you want to access the views in. Expand the drawing with the view that you want to add to another sheet's paper space. Once it is expanded drag the view into paper space or right click and choose Place on Sheet. Now you can place the view on the sheet at the default scale or right click and choose the scale to add the view as. The command adds the referenced sheet to the current drawing as an xref. Select the view you want and then press OK and the view you chose should be the view you see when the file opens. The M indicates model space and if a P shows up it indicates a paper space view. An example of a label that utilizes it may be found here, under the date of 11-30-2007. It needs some work to be usable, but should point you in the correct direction. First of all I would like to thank Chris for allowing me to post my Civil 3D reminders here as well. I have referenced Chris' blog countless time to help me remember labeling ideas, routines, etc. Well have you ever struggled with the Transformation of points within Civil 3d? Well I have, so the purpose of this post goes along with Chris' theme of posting helpful reminders for the future. Create an appropriate "Point File Format" (This is found in the settings or if you go to Points-> Import/Export Point -> Transfer Points, you can choose manage and then create a new user format). -For my handheld points, I created a "Point File Format" that was Lat Longs -> WGS84 datum, Lat-Long, West Positive; Degrees -180 to +180. I then choose "deliminated by" and then placed a comma in the box. Next I set up the format of my source "Point File"; Point Number, DECGEG Latitude, DECDEG Longitude, Point Elevation, Raw Description. -Since my project is located in San Bernardino County, I was able to use CalTrans' website to determine that I am in Zone 5 of the Californina State Plane and I am using the US Foot for my units and am using NAD83. As I did above, I need to create a new "Point File Format" for my NAD83 California State Planes, Zone V, US Foot format. Again I choose "deliminated by" and then placed a comma in the box and then set up the format for my destination "Point File"; Point Number, Grid Northing, Grid Easting, Point Elevation, Raw Description. Then I click "OK" within the Transfer Command. A new text file is created with the Transformed Points. The text file titled "two" is the original point coordiante from the Handheld GPS device. The file titled "test" is the output from the transformation. Alternatively you can import your points from your handheld GPS unit using a drawing that is setup for Lats and Longs and then "Export" using the "Point File Format" that you created above. BAM! You now have a point file that is on the coordinate system that corresponds to your design coordinate system. First I would like to introduce my coworker Jason to any of the regular viewers of my blog. Jason has helped me and the office I work in to make the transition to Civil3D from Land Desktop. Hopefully you will find Jason's reminders as helpful as you find mine. I would also like to thank Engineered Efficiency for the free shirt and Mastering Civil3D book, even if the book was a mistake on the part of one of the EE team members. For the rest of the post it will be a reminder to me of my AU experience. The whole point of the blog was to put what I found out about Civil 3D and Map and Autocad here so I could remember what I figured out and how to recreate it. I usually regret finding something out and then having to do it over and not remembering how to do it. This blog seemed like a better container then the office network or my home computer, I just have to remember to use it. First lesson I learned at AU this year is the a benefit of being a presenter is the ready supply of water and the quick access to the Internet in the Speaker Ready Room. Don't have to wait for a free computer in the common areas. You also have the opportunity to talk to the notables who bring you Civil 3D. The second lesson I learned is that you should do a good job of doing your description of your class. I got this from feedback from my coworkers comments and my own presentation experience. My coworkers found that some classes didn't deliver on the description of the course. I think my problem was the exact opposite. I think I didn't convey the complexity of my presentation. I did submit it as an advanced course, but I lost half of my audience by the end. I did hear some positive feedback from some of the people who remained to the end. I probably should have stressed the modifying of rules rather than just covering the basics. I also learned that people care about seeing the menu bar, even if it is not pertinent to the concepts being presented. While not being able to see the menu bar was a technical difficulty out of my control, I thought it was interesting since most people should know what the Civil 3D menu bar looks like. If I go next year I think I will try to remember to ask for a room on the strip. The view from the strip, I find, to be more interesting then the view I have of the Hilton Hotel and the city lights behind it. If you do use AVI's in your presentation, I think it would be better to record the whole presentation, that way you aren't hindered by the powerpoint interface which doesn't seem optimized to use video within the program. I messed up twice with my mouse trying to pause the avi's. I think they should show how big the class is going to be. In hearing the Webcasts for the presenters leading up to the event, it was conveyed that as the class size grows larger the technical content of the class may need to go down. I think this suggestion is made to satisfy the majority of the class who attends. I am also looking forward to getting my resolution back to 1680x1050, the AU projectors are set to 1280x1024 and I find that too small on my laptop. I also can't wait to see the 2009 beta and the new features that will be included since I am signed up on the myfeedback.autodesk.com website. This short video shows how to add the total parcel area to a Parcel Area Table. As demonstrated in the video the overall parcel label style needs to be assigned to add it to the table. Just make one that doesn't show any portion of the label and it should work, or move the label off to the side so it doesn't print. To create a pipe rule you need to understand the structure of a rule. The basic portions of the rule contain four parts. All of the parts start with the name of the Module followed by the name of the part of the rule. The four parts are called _GetInputParameters, _GetOutputParameters, _ApplyRule and _ValidationRule. The first two are usually called, but no code usually goes there. I'm not quite sure what it does, but since the OOTB rules don't use it I don't sweat it too much. The next two parts are where most of the work happens. The _ApplyRule part tells Civil 3D how the rule should be applied. This part is where you want to tell the program how to apply the rule. I usually start with an existing rule that is close to what I want to accomplish and then modify it to meet my needs. 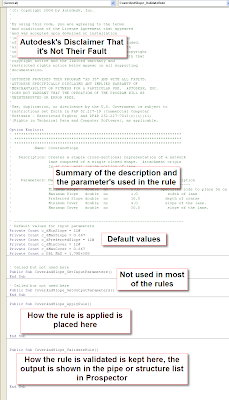 The _ValidationRule part tells Civil 3D how it should check to see how the rule is to be checked. If you don't want a warning message to show up in Prospector, just leave the code portion blank. When you set up the XML file to tell Civil 3D what values to use, you probably want to have the user see the correct number format. 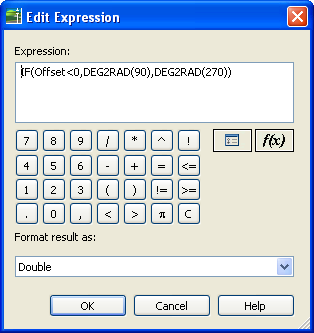 Civil 3D uses a numeric code to determine what format the number should be. It is stored in the XML file under the TypeInfo under the Params folder. Type 25 is a percent number, Type 16 is feet or meters. Those are the two types used in the rules, I haven't tried to figure out what the other numbers do, so I can't provide what they do here. While this isn't a complete list of steps to create the rule, it should provide a little more insight on how to create your own custom pipe rules. Here is a way to change the units of a drawing and all of the feature settings of the objects. If a little blue down arrow shows up after changing the values to the right of the unit changed, make sure to click the blue arrow to override the naughty children. The screencast of the presentation may be found on the AU website. I did a video, without sound, of using the laydel command to delete layers from a drawing. Using the laydel command deletes the layers from the style and sets them to 0 after an audit. 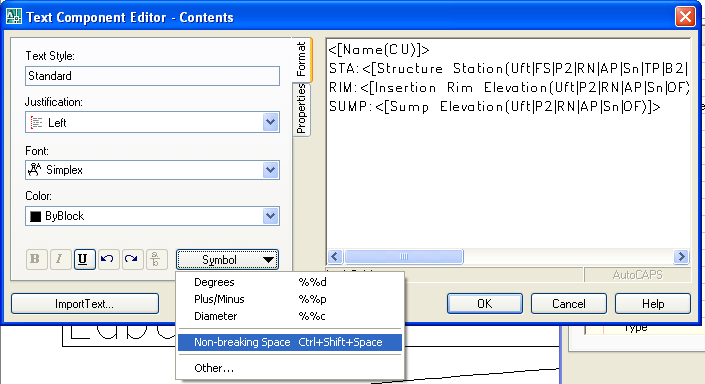 You can now use an expression to set the rotation of an object, in Civil 3D 2008. For instance if you want a Station Offset label to look like the picture below previously you needed two labels, one for the left and one for the right side of the alignment, or an expression to have two different label heights (see the style on 10-28-2007). 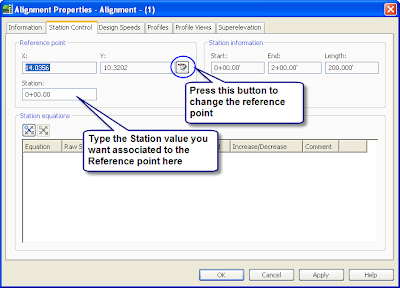 To create an expression for the label we need to use an If statement to see if the Station Offset Label is to the left or right of the alignment. Then based on what the value is we set the rotation to 90 or 270 degrees. Since the rotation value uses radians, and I don't do radians, we will need to convert the degrees to radians with the DEG2RAD() function. I placed an example that isn't pretty, but works on the Intermittent Block or Style of the Day site (see 11-03-07). If you haven't moved from Civil 3D 2007 (SP3) to Civil 3D 2008 and you use data shortcuts here is another reason you may want to upgrade. 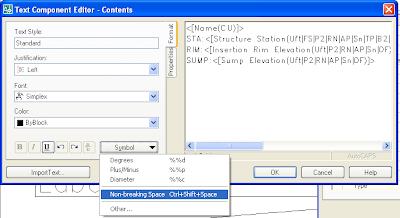 In Civil 3D 2007 (SP3) data shortcuts where located by object handle and name. In 2008 they changed how the xml file is created and now the data shortcut only cares about the object handle. This means that if you start out with Street A type names for the alignments you can change them to the actual street name once you get them. As an added bonus the program makes the change when you bring the file forward from 2007 to 2008. So if you have this problem currently, now is a good time to upgrade. The poll was unanimous in requesting that I should post again, I'm just glad I'm still smarter than my 2 year old daughter. I've been busy moving and writing my AU paper and didn't have time to post here. I'm going with something that I just discovered with doing some CAD work. You can use the ddedit command to modify text in a dimension style. Just type ddedit and then select the annotation in a dimension label you want to modify. It even keeps the original dimension in the label, if you want or you can delete it and add your own fake dimension. Much easier than the way I was doing it through Properties. Have you ever wanted to change a subassembly from the right side to the left side or vise verse. You have probably tried to do it in the properties window and noticed it is greyed out, it just won't let you do it. There is a way to change it by going into the subassembly properties dialog box (just right click and choose subassembly properties...). Just go the parameters tab and click on the side box and choose left or right. You can also change the attachment points of curbs in this same manner. And since it was overwhelming in the poll questions to add pictures, I did this time. Have you ever had the need to show a portion of an alignment as existing and another portion as proposed? While you can't do it with one profile view you can do it with two. Create a profile view for the range of the profile you want shown as proposed. Next create a profile view for the existing station range. Now just set them side by side with the matching station adjacent to each other. The profiles should look like one profile. To change one of the profiles to look different go in to the Profile View Properties, Profile tab and set the Override Style to the one you want to show. You now should have a profile that changes looks along its range. Sorry no pictures, just being lazy today. This method needs improvement, but it does create a AutoCAD table of bearings and distances or any other information you want added. Save as ESRI SHP file. On the selection Tab choose line and the objects you want exported. On the Data tab add the information you want in your table. Save the profile for use the next time. Open the *.dbf that is created during export. Copy the cells you want for your table. Paste Special the cells into AutoCAD as AutoCAD Entity. Change the format of the angle cells to Surveyor's Units. Use the Annotation feature under Map to add the Tag labels. You may need to fill the holes by using Help, you may even find a better way and not have to export the file while looking in Help. If your looking to take (or avoid) my AU class this year look for my Autodesk provided stage name of testspeaker, testspeaker. Also I am looking to do a run through of my AU presentation here in San Luis Obispo, CA. I'm looking to do it on September 18. If you are interested then drop me a line at fredbobchris@gmail.com for additional details. Here is something important to remember if you are having difficulty with a surface after creating the surface with imported points (the drawing is crashing). Make sure the elevations are with in a reasonable distance to each other. If one of the spots is at 110' and a single other point is at say 985,659,268.000' and another point at 9,587.843' the drawing will crash when you want to show contours at a foot interval. Well I guess it wouldn't crash if you had enough memory to draw all those contours. I could see how this would make a decent practical joke on someone, especially on a surface that they have been working in for a period of time. Have you ever wanted to split a block in half (or any other fraction of it)? If you have then the next time you need one split try using the AEC Modify Tool, Divide. To use the command just right click in model space and choose the AEC Modify > Divide. Then choose the linework or block you want split. Pick two points in the drawing, they don't need to be across the over the linework or block since the program extends the two points to the outer most edge of the linework. This also works on other objects than just blocks and may be an alternative method to break lines without having a gap. I can never remember how to break a line or polyline and not have a gap. I've been using the AEC Modify - Extend and Trim commands for extending and trimming to profile objects and its been working well. I thought I would take a look the subtract tool. This one would be a useful in creating details. It takes linework and trims out one linework from another. The two benefits of this command is that you can trim blocks with it and trim with AEC objects, such as subassemblies. To use just right click in model or paper space and choose AEC Modify Tools> Subtract select the linework you are going to subtract from (or edit) then press enter and then choose the objects that are going to subtract from the first objects selected. Look on page 1395 of the User's Guide for a picture of how the command works. 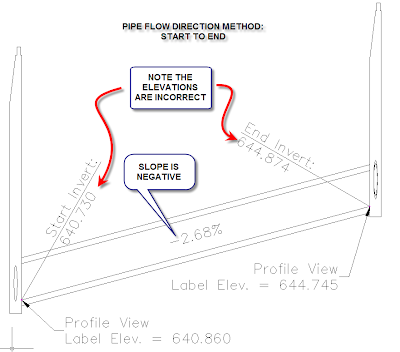 I have a post on http://www.civil3d.com/ on VBA pipe code. Below is a link to sample code which is similar to what I posted at Civil3d.com. The code at the link below gives the point at an offset of 10 feet from the assigned pipe's alignment. The code is in no way complete, but will provide a good starting point to create your own code for creating points from your pipes. 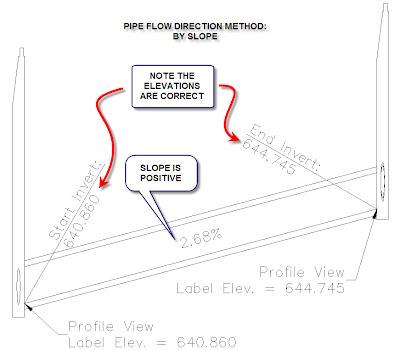 Here is how the various flow direction methods affect if the slope is positive or negative. Ignore the incorrect/correct invert notes, its for what's going in my AU presentation this year. The last picture indicates how the pipe was laid out and how to change the flow direction method. It can also be changed in Toolspace. I'm throwing away my post it attached to my computer with reminder commands and putting it here for later use. Changes from giving coordinates to original values typed into the command line. Don't know if it affects dynamic input. Use one of the lower values, set to 2. Use when the program changes these values to 0. To have a second line text in dimensions. Just the settings the office prefers. Changes the mirror to actually mirror text, or mirror text so the text is legible. Turns on and off the Map task pane. Converts the drawing from a ctb plot style to an stb plot style or the other way around. Copy and paste it into the command line and it will change all of the blocks to unitless. If the 0 is changed to 1 then the blocks are changed to inches, 2 is feet, 3 is miles, 4 is mm, 5 is cm, 6 is meters, 7 is km, 8 is microinches, 9 is mils, 10 is yards, 11 is Angstroms, 12 is nanometers, 13 is microns, 14 is decimeters, 15 is Dekameters, 16 is Hectometers, 17 is Gigameters, 18 is Astronomical Units, 19 is Light Years, 20 is Parsecs. ATTSYNC - Update block attributes. PLINETYPE Allows you to draw Polyline2D, change the values. You can use the AEC Modify Trim to edges of Civil 3D objects (or any other objects). Just choose it from the right click menu, choose the object you want to trim, then hit enter to be able to select an edge in the drawing, then select the edge in the drawing (a red line will appear indicating the edge that will be selected), then choose the side you want trimmed. This is helpful for trimming against Civil 3D objects that you can't trim to using the normal trim command. For instance if you have a line in profile view and you want it trimmed to a profile you can do it with this command. The only thing lacking in my opinion is the ability to select a profile vertical curve as an edge. This is one that is hidden in help. When you right click in model space an option comes up for AEC Modify Tools. There is several options in the list, but the one I am talking about today is the Extend option. The AEC Modify Tool > Extend allows you to extend to an object, similar to the basic Autocad extend, except this one alows you to extend to a plane of the target edge. It's kind of hard to explain in word so the following pictures should show feature. The original two lines, I am going to extend the blue line to the edge of the red line. This un-QA-QC'd code works on my one computer and one drawing that I have tried it on. It may not work for you. For it to work it requires that all of the pipes involved have alignments assigned. 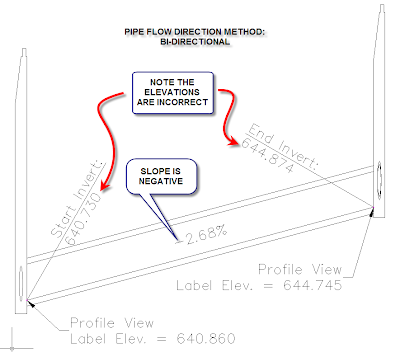 See the pipe rules post for an easy way to assign an alignment as you layout a pipe network horizontally. Once started you will be prompted to select a sewer lateral pipe. This will select the pipe and the program will use the pipe network the pipe is in. I separate the main line and sewer laterals into two pipe networks. This is so the laterals don't break the main line pipes when I am laying them out. Then select a main line pipe. It will then adjust any pipes in the sewer laterals pipe network that have an offset of +/- 1' from a main line alignment's pipe. It adjust it so the invert of the lateral pipe is at the top of the pipe. If you want to match another part of main line pipe, just adjust the code to put it where you want. The code is in two spots near the end of the code. The code may take a while depending on how many pipes are in the network. This is mainly because I am not an expert programmer. The file can be found here, Laterals.dvb. I haven't actually used this, but in theory it should work. A sample style is available on the other site. Make the same numbered curves or lines have numbers in the 1000's then create an expression that divides to the number you want. So if you use 1000 and want 1 divide by 1000. The labels won't let you use the expression in the tag portion, so make the tag visibility to false, then add a text component and set the use to tag and label. Then you can have on master table to sort by length to make sure you have all of the numbers at the correct space. Pipe Rules Fixed - I think??? I corrected the problems with the pipe rules. The corrected versions are now on the other page. The pipe rules I posted has some problems. For one if you are far away from zero, it may give you an overflow error. Just change the integer value to Double for all of the Dim, except i. If an start/end point doesn't project to the alignment it returns a value of zero instead of null. I currently am looking for a solution to 2. Have you ever wanted the assigned alignment to be relevant to where you are working at in the drawing? If you are like me you have one super duper pipe network for the sewer on your site. It can be a pain remembering to change the default Pipe Network alignment as you work to ensure that you are using the correct one, and going back and changing it can be confusing if you use the default names of Pipe - (234). These two rules will automate the process for you, somewhat. It only works if the alignments are on top of the pipe, +/- 1 unit. So if you use the center line of the road instead of the center line of the pipe it won't work. I've written two rules for Pipe Networks. So far I haven't had any problems, but who knows what the future holds. The two rules are called Alignment and AlignmentLaterals. Alignment: This assigns the alignment to the pipe based on the start and end stations offset values. If the start offset and end offset are +/- 1 foot away from an alignment in the drawing the alignment is set as the reference alignment. AlignmentLateral: This assigns the alignment to the pipe based on the start and end stations offset values. If the start offset or end offset are +/- 1 foot away from an alignment in the drawing the alignment is set as the reference alignment. To use the new rules, copy the existing two files with the same name to a new location as a backup. Then place the two files you downloaded into the folder you found the original two files. Restart Civil 3D, if you had it open. 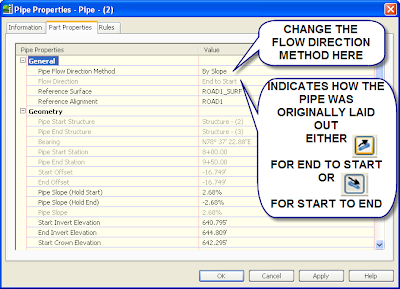 When you open up Civil 3D the two new rules will be available when you create rule sets, or apply it to existing pipes. I'm not the greatest programmer so the code is probably slower than it should be. I also don't know exactly happens when you share the file with someone else who doesn't have the custom rules. I'm pretty sure it is just an error message in the event viewer. I added a vba program to this page (6-30-07). I may have not have set all of the References correctly if you are using Excel 2003 or earlier. So if you downloaded it and it didn't work this is why. I haven't fixed it, too busy trying to make it do something else related to sewer laterals. This is just a reminder to myself how to do the first step, adding the information to the xml file which will point to a rule in the C3DPipeRules.dvb file. I would not suggest doing this until I get more information or if you have an install that you can mess around with. I don't fully know the ramifications of this or if it actually works. Open the C:\Documents and Settings\All Users\Application Data\Autodesk\C3D 2008\enu\C3DPiperules.xml file. I prefer the XML Notepad. Expand the folder heirachy under Categories, then Category, then Tools. You should see a list of Tool under Tools. Copy any of the Tool Folders by right clicking and choosing copy. Paste the item under Tools. The first thing we need to do is give the idValue, under ItemID its own unique identifier. If I remember correctly it should be a random string of numbers, so change the numbers randomly. Hopefully I will find out where you can generate the idValues, until that time changing it should work. Next expand Properties, ItemName. The resource is how it chooses what name it uses in Civil 3D. Choose a alpha only name for the new rule, without quotes. If you put in a number such as 155, Civil 3D will give you an error message that it can't find resource 155 but will add the resource to the list of rules as 155. If you use quotes Civil 3D will also give you an error message. Leave the src alone. Next expand Data, Macro and type in a name of what you are going to call the module and routine in the VBA file. I'm going to call it SetSumpDepthCustom.SetSumpDepthCustom. Change the DisplayName under SumpDepthValue2 to Sump Depth Custom. Now save the XML file. Open Civl 3D and the rule will be listed in the list of rules, in this case for structures. I haven't created the macro yet so an error message is appearing in the Panorama window stating that it can't find the macro. This is a good sign since it looks like you can create a custom pipe rule this way and have it apply to the network. The next step is creating the macro and getting that to work. Type CUI at the command line. This is a basic one, but somehow I overlooked it, you can have pipes and structures in different profile views, in the same drawing, have different styles using the Style Override column in the Pipe Networks tab of the Profile View Properties. Just put the check mark in the box and select the style you want it to be. In 2007 you need to have the style already created, in 2008 the ability to create or copy and edit a style from the command is there. Here is a way to layout sewer laterals with Civil 3D to use as line work in a base file. It assumes you have an alignment at your pipe centerline. First create a dynamic block or use the one found here. 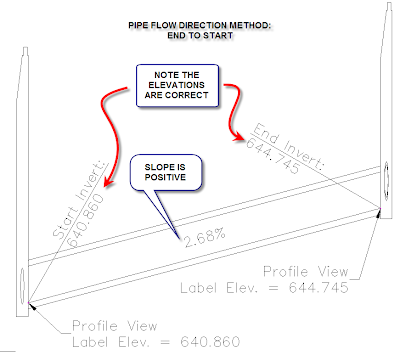 Add the label to a line and curve label, I have created a sample at the same location in step 1. Add the label at the locations along the alignment where you want the laterals to go. Flip any labels to the other side of the line or have two styles on for left and one for right. Make any adjustments you need to make. Explode the line and curve labels twice. If you are using Civil 3D you will need to save, close and reopen the drawing. Civil 3D 2007 crashes when you try to move a grip of the dynamic block. Civil 3D 2008 tends to like this a little more. Move the grips to the property line or whatever location the lateral needs to go to. There may be other unforeseen problems, but should save step in rotating each sewer lateral block. 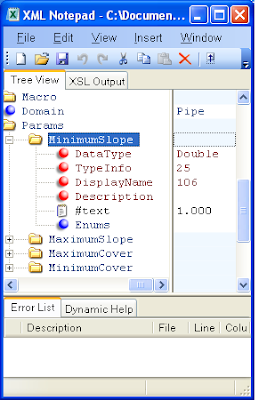 To combine pipe networks export the network you want to put into another pipe network to an xml file. Next delete the just exported pipe network and rename the pipe network to the name of the exported pipe network. Then import the xml file back into the drawing. The pipe network will now be combined. This also works with pipe networks in different files. When you do this make sure the pipes and structures have different names or change them after you do the import. Having pipes or structures of the same name will cause problems in the drawing. If you need to open a newer version of software because you are using an older version of AutoCAD you can use DWG TrueView™ available as a free download from Autodesk (there is even a 64 bit version available). It is also handy to send it to clients or other engineers instead of doing all of the work in converting the files to an older version. For Civil 3D files you will need to make sure Proxygraphics is set to 1 before sending out for them to see something other than empty rectangles. Also the labels don't rotate to match the paperspace viewport, only rotate per Model Space. Sorry for the rant, but I saw Even Almighty and was mighty disappointed on the viewpoint of the film and the profession I have chosen to do in life. First the whole dam portion of the plot was ridiculous and totally out of whack with reality. For one a dam is in no way governed by building codes as mentioned more than once in the movie. Dams, at least in the State of California, are governed by the Water Resources, Division of Safety of Dams or the Army Corps of Engineers. While the supporting structures are governed by the building codes, the dam is in no way contained in the building code. The premise of a Congressman being able to control the building process enough to have a dam of the size shown built shabbily is also ridiculous considering the amount of people involved in the construction of a dam. First you have the agency who needs the dam for drinking water storage or for Storm flow storage. Since most agencies no longer keep a large number of staff on hand an engineering company is hired to design the structure, then you have a Contractor who is going to build the dam. Then you have all of the people who are against dams, regardless of the benefits, that would point out any and all perceived design flaw. Each participant has some liability in the final output (except for the anti-dam people), I could concede that one participant could do the faulty construction, I do not think a Congressmen could pull this off, let alone profit from it. While Civil Engineers are not specifically singled out, the film does shed Civil Engineers in a bad light since it is guilt by association. My next beef with the film is the impression that development is inherently bad because it occupies land previously undeveloped. All I have to ask is where are these people supposed to live? All these people are are children and immigrants (both legal and illegal). The only way to stop the destruction of natural places is to stop the production of people. I don't think that is a realistic solution to the problem. Another solution is infill in existing cities and towns. Unfortunately this also has problems, since a portion of people are adamantly against this. For instance any development project in the award winning downtown in the city San Luis Obispo, where I work, is derided as not fitting in and potentially destroying the character of downtown. How can this be, since this is how the downtown was created in the first place. The downtown of San Luis Obispo was created by various building dating from the mid 1700 to current day. People are also against building up, at least a portion of people in my town, so it looks like the current proposal to increase the height of buildings may not go through. An increased height would potentially increase the density of downtown and prevent the development of agricultural or raw land. Quite frankly I am tired of going to movies and being preached at on environmental issues. It is especially galling that the movie cost $175 million dollars to make. If they really wanted to make a difference they would have saved 20% ($35,000,000) of the cost of the movie, bought the land they profess should be saved, and prominently provide an advertisement of where people could add to the fund (either at the beginning or end of the movie or both). But I guess they really don't believe it and are only trying to sell tickets. I'm a big fan of Sheet Set Manager, if you aren't using it I think you should. You can also use it in conjunction with fields to help with sheet numbers, sheet titles and other repetitive items. This way you don't have to go through every file when you change/add/delete a sheet, you just have to change it in Sheet Set Manager and print. It also makes it easy to print a whole set of plans at one time. There are many sources of information if you do a search on your favorite search engine. When creating profile or profile view labels and not all of the items are flipping, in my most recent experience a vertical line in the label wasn't flipping, change it so only on piece of the label is attached to the feature. Doing this corrected the problem and the label worked as expected and flipped quite nicely. This probably applies while working with 2007 or 2008 in AutoCAD, but make sure that the drawing settings for scale is the same as the viewports to get the Civil 3D objects to show up correctly. Somehow I got selected to be a speaker at Autodesk University 2007. I have a real exciting title of "Sanitary Sewer Design". I went last year and had a fun time. Since I seem to be a sucker for Google products I added the code for Google Analytics to this site. I just added it on June 4, but I am amazed at what type of information it provides. I can tell where all of the viewers are coming from, how many pages they saw, what browser they are using and much more. Most of the viewers are from the United States though, with 25 states and the District of Columbia represented, mostly from California though. Microsoft provides a free XML Notepad program for editing XML file. It makes it alot easier to see and change values in the XML file. The first one is the default and to switch between drawings use alt+tab, for the second one switch between drawings with alt+tab. The option to change it in Microsoft Office products is under options. This is from Microsoft Office 2007. The change in the UI for the Microsoft Office is a bigger change the CTRL click for subentities in AutoCAD. This post in the news group is helpful in making the command line history longer and outputting it to a file. It is helpful in getting a list of all of the commands loaded in Civil 3D. Type ARX and then C for commands.